Experiencing Los Angeles: "R" Spells "Relief"
Two weeks ago today voters in Los Angeles approved Measure R, which increases the sales tax in Los Angeles by 1/2 a percent. As a tax increase, the measure needed a "super majority" (66.67%) and passed - barely - with 67.22%. view from inside the No. 2 MTA bus (heading north on Sepulveda) - stuck in traffic along with everyone else. At least the bus' windshields are clean, right? The concept of "getting people out of their cars" happens naturally when it's quicker to take a subway or light rail than your car. 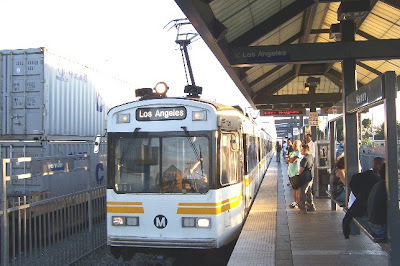 While not necessarily providing a visionary mass transit system for Los Angeles, the passage of Measure R will provide some relief, and complete several of the light rail projects in the works. 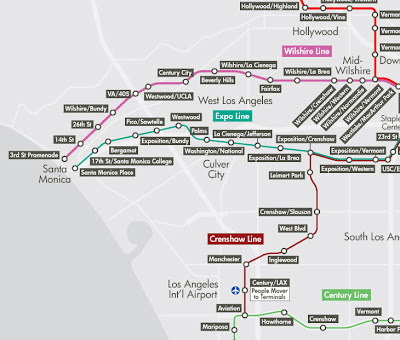 It will also provide the needed funding for the Purple Line - the Wilshire Blvd. 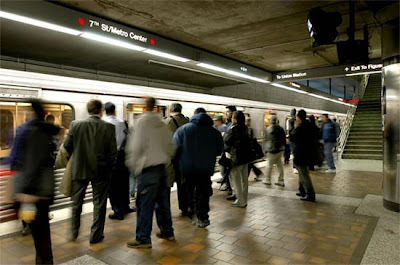 "Subway to the Sea" - which now ends at Western Ave. in Koreatown. Unfortunately, the tax doesn't take effect until July of next year. Voters approved this measure - why is it taking another half a year to start funding the projects we need? Stuck in gridlock traffic is NOT my idea of political leadership. Either is taking money earmarked for transportation to pay for other things. cheaper gas = less incentive to conserve. Stuck on San Diego Frwy near Westwood last week . Ironically, this past summer when gasoline was peaking out at $4.50 a gallon - it made a dent in traffic. In most places, you actually noticed the difference. Now that gas is down to around $2.50 a gallon, traffic is again terrible. I may be in the minority here, but I wouldn't mind paying more for gas is the difference went directly to immediate traffic relief. I only take the bus when I'm going to UCLA, but how many more Angelenos would ride the MTA if the fare was just 50 cents? Just wondering. What is our time worth? Obviously something. Thanks, Los Angeles, for passing Measure R ... so we can all do a better job of making the most of our time.